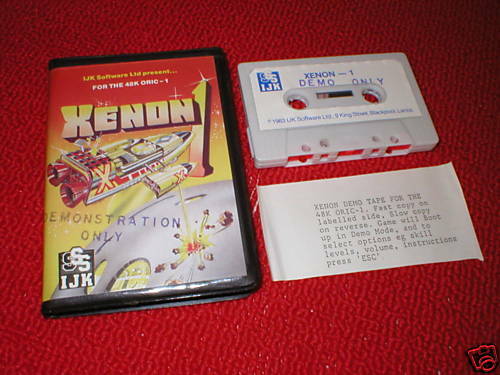 Has anyone got the Xenon-1 demo version? It was sold on Ebay long ago, and I was told by the buyer that it was a demo of the game simply playing in loop, but he re-sold it by then. I'd be really curious to see it, it was packaged in the usual Xenon-1 case but IIRC the tape was stamped "DEMO". Interesting, never heard of that one! one of the first demos in the computing industry ? 1st one? I'd rather bet for the Oric-1 demo ! Whoa, I had no idea anything like this existed. I assume this was for use in shops, to show the games working? I knew the distributor of Oric in Australia back in the day, and these DEMO tapes were distributed for shops to have something running on the Oric hardware - as far as I can remember, they had a mode where they just 'scrolled' through a bunch of screenshots or something, some sort of gimmick that the regular playing game didn't need. There were a few other DEMO tapes, if I remember correctly, based on my recollection of the Warehouse in Australia (Melbourne) at the time. robcook wrote: Whoa, I had no idea anything like this existed. I assume this was for use in shops, to show the games working? That's right. It's thanks to this demo that I got an Oric-1 when I was only 11. I would probably have ended up with a ZX Spectrum if this demo hadn't been running on a TV next to the Computer displays in our local COMET store in Halifax. I found the tape and transferred it a few months ago - here it is! Doesn't load for me .. I just get a black screen, looks like its in HIRES mode after failing to run something ..
ibisum wrote: Doesn't load for me .. I just get a black screen, looks like its in HIRES mode after failing to run something ..
Ah, makes sense. Will try it and let you know ..